Looking for a ring that is made specifically for you or your loved one, but feel like you don’t have the creativity to design it yourself? Bespoke has two options to fashion exactly what you are looking for! Choose from one of our many pre-designed rings. Each of these rings are made specifically for you: your style, your precious metal, your precious stone size and quality, your ring size, and much more. You get the credit for a custom made ring without doing any work! “James” and “Missy” had been dating since junior year of college. He knew she was the gal he wanted to spend the rest of his life with. There was nothing else left to do but put a ring on her finger! James had some idea of what he wanted the engagement ring to look like, but didn’t know where to start. Thankfully, he knew a Bespoke representative who was happy to work with him to create a ring Missy would love. The main things on James’ list were a round brilliant center diamond, side diamonds, and a unique setting. Bespoke then showed James a a nice variety of pre-designed settings that met all his criteria. After reviewing the settings, James decided to go with style 1968. He loved that the side stones were turned princess cut diamonds as this added a depth to the ring’s design and set it apart from standard side stone engagement rings. As you can see from the picture on the right above, Missy not only loved her engagement ring, but added a matching wedding band to it as well. Great job, James! Similar to pre-designed jewelry you start with one of our already designed styles, yet you can take it a step further. Change the setting’s finish, number of gemstones, type and quality of gemstones, and many more options. Go ahead. Let you creativity go wild! “Don” wanted to get his wife “Katie” a birthstone family ring for her birthday. The ring would represent their two children who were born in July and November along with their family pets who have birthdays in April. Don knew that he couldn’t just walk into any jewelry store and pick this special ring out of a case. Thus, he called Bespoke Fine Jewelry. After setting up a convenient time for Katie to meet, a Bespoke representative showed her a large selection of pre-designed rings that fit Katie’s design wishes. Katie narrowed it down to a few designs then after thinking about it for a little bit settled on style 1082. It was perfect with its clean lines, modern design, and four stone placement to represent her family. With the ring’s design style set all that was left was for Bespoke to create Katie’s ring. 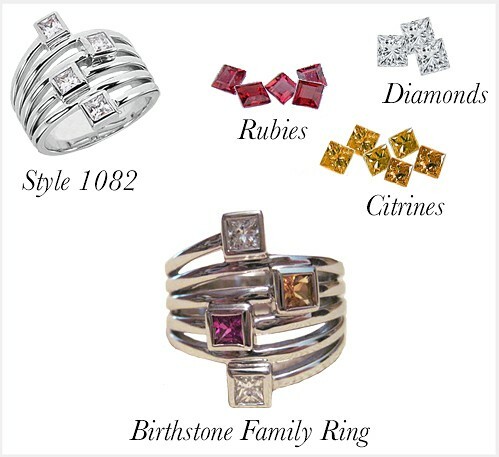 Using 18K white gold, E/F, VS white diamonds, and high quality rubies and citrines the perfect family ring was formed! Don got praise for thoughtful birthday gift, and Katie has a ring that reminds her of her family every day.